Ten years ago, I was a freshman at Sacred Heart High School in Vineland, NJ. 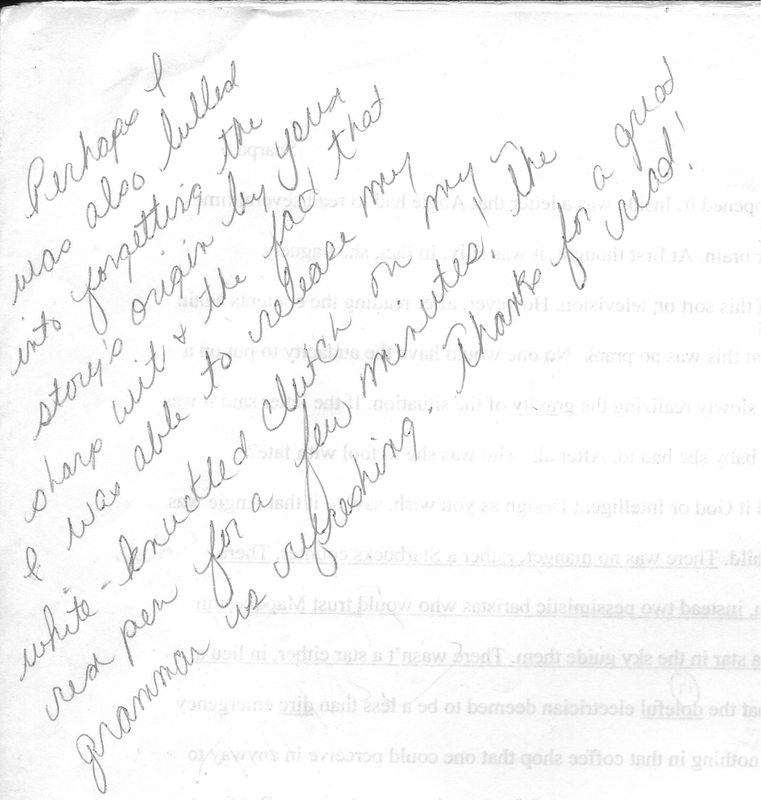 I was, for the most part, massively unhappy, as one is in high school, especially an ultra-conservative high school where we were made to watch a VHS tape of a performed abortion for health class—permanent damage and brainwashing, no permission slip necessary!—and were given 100s for test grades if we attended pro-life rallies. All this in the second least-educated city in the country, according to Forbes. Needless to say, by freshman year, I felt extremely isolated from those around me. I shared none of their interests and they found mine odd, to put it more kindly than they did. I listened to Joni Mitchell and Tori Amos and Fiona Apple and Bjork and PJ Harvey. I rented movies almost exclusively from the one shelf at Blockbuster reserved for foreign films. And I had a ferocious appetite for books. Neither of my parents were big readers, but I made due. I’d read the dozen Danielle Steel and Jackie Collins books my mother had. I’d read The Firm and The Client and A Time To Kill, dusty copies of which I’d found in my great-aunt’s basement. And I checked out books from the local library two dozen at a time. I wanted ways out of my life—my unceasing nervousness and sadness, which would take another five years to diagnose as bipolar disorder—and the music I liked, the films I watched, and the books I read were the only things escaping me from it. Enter Mrs. Scapellato, my freshman English teacher, who, like so many of the vital English teachers who find their way into the lives of writers, who in fact ignite the love of writing, came into my life at exactly the right time and quickly became my savior. She was young and beautiful, whip-smart and fiercely passionate about literature. When teaching Frost’s “Stopping By Woods on a Snowy Evening,” she taught us to hear how its rhythm mimicked that of a horse’s trotting—an observation which I found far more awe-inspiring and exciting than the water-into-wine, risen-from-the-dead stuff of theology. My crush on her was deep, only the first of many times I’d fall hard for someone with good sentences. Luckily, she took a liking to me. I like to think it’s because she saw from the get-go a distinct glimmer of promise in me, which may be true, but it’s just as likely that I simply gave her no choice, as I would often skip lunch and ask to eat in her classroom, feigning nerves about cafeteria bullies when really I just wanted to be around her. It didn’t take long for me to be labeled a teacher’s pet, a label which bothered me not at all. As I said: painful. [Though there is a line earlier in the story where Mary, upon waking up to see that it is snowing on Christmas, “felt the weather to be a personal achievement,” which isn’t half-bad.] 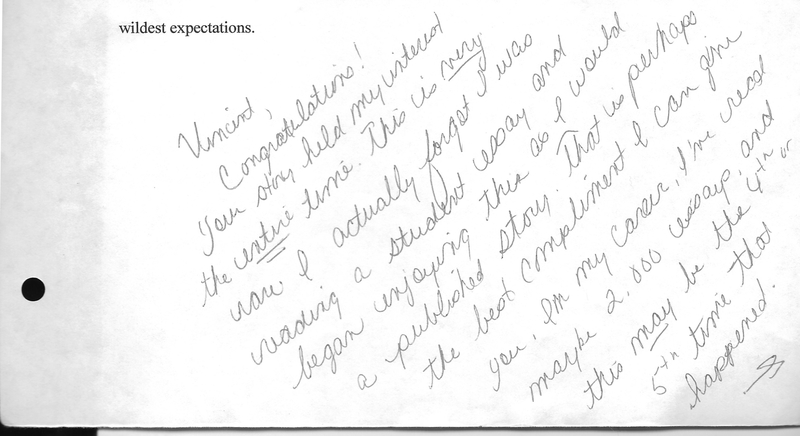 Cringeworthy as it may be to read now, I remember feeling quite proud as I turned in my manuscript to Mrs. Scapellato. We wouldn’t be getting them back until we returned to school in January, and so I spent much of my winter break wondering if she’d read my story, if she’d liked it—the beginning of a life of waiting to hear back from someone important on whether or not they liked my work. At the end of our first class back from break, Mrs. Scapellato handed our stories back to us, saying that our grades could be improved if we made corrections and handed in a revision. The bell rang as she was handing them out, my classmates who’d received their stories already filing out of the room. I’m toward the end of the alphabet, so I waited. When she handed it to me, she asked me to stay behind for a few minutes, said she would write me a late pass for next period. I was terrified. Had I crossed a line with my sacrilegious imagination? I didn’t have cause to worry for long, though, because once the classroom was empty but for us, she told me she’d loved my story, that she was in fact shocked it had come from the mind of a fourteen-year-old. A generous, sized-to-scale appreciation, obviously, but I could tell she meant it and that meant absolutely everything to me, then and now. Mrs. Scapellato became pregnant and left Sacred Heart the next year, but we kept in touch sporadically. I emailed her when I was accepted into an undergraduate creative writing program. I sent her a copy of the first magazine I’d ever published a story in. I called her when I found out that I’d won the Norman Mailer College Fiction Award and when I found out I was admitted into the MFA program of my dreams. If it comes to pass that I ever publish a book, I can’t imagine dedicating it to anybody else. She’s the person to whom I can trace all of this back. She gave me something that day of such importance and size—enthusiastic and meaningful permission—and my gratitude is eternal, too big for language to hold. Vincent Scarpa is a third-year master’s candidate in fiction at the Michener Center for Writers. His stories and essays have appeared or are forthcoming in Electric Literature’s Recommended Reading, StoryQuarterly, Indiana Review, Brevity, and other journals. He is a previous recipient of the Norman Mailer College Fiction award. He tweets at @vincentscarpa.